The April 2015 issue of MAGIC Magazine is now in the mail, but the digital edition is already waiting for you on MyMagazines. Click here to log in and start reading. 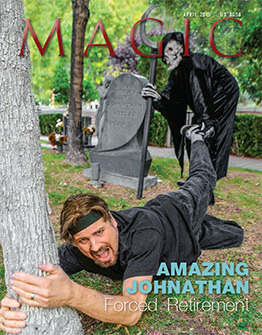 Our cover story this month is shocking, funny, and sad, as The Amazing Johnathan talks about his life, his lifestyle, and his current medical condition. It is one of the most candid interviews we’ve ever run. There’s also how a magic trick is brought to market, how an illusionist helps non-profit organizations help themselves, how David Ben is rethinking The Expert at the Card Table — and a lot more.